Welcome to my first post on a Bay Area restaurant! I didn’t take any pictures of the interior or exterior — I wasn’t sure I was ready to blog at the time we dined, but apparently I was. So let’s roll right into this joint – or stumble into it after nine miles of walking San Francisco’s hills, as the case was for us. The vibe I took from Leopold’s was suave schmaltziness. It felt like the Pottery Barn’s version of Bavaria complete with mounted white ceramic antlers I know I’ve seen at some upscale home goods store. The wait staff was dressed in a relaxed version of lederhosen and braids, and our waitress was pleasant. The wooden tables and booths filled up with chatty families and large groups relatively fast. We arrived right at opening, as Yelp had advised us because Leopold’s does not take reservations. As often happens, Ben and I split an appetizer and an entrée. Our first course was crispy pig trotters with frisée, a poached egg, fingerling potatoes, and pickled shallots. I’m at the point in my foodie career when I don’t ask for clarification on what some foods are. 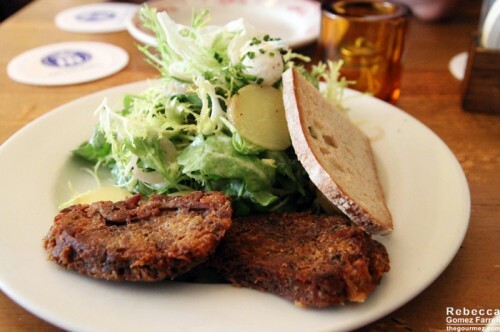 I expected the trotters to be pigs’ feet, but what we had was served in disks of chopped and fried meat rather than anything resembling an animal’s toes. I’m not sure I want to know what they were beyond salty, crunchy, pork-flavored chunks. The single, tiny poached egg wasn’t enough to lend the dish the extra richness it deserves, but I liked the soft fingerling texture in combination with the frisée’s bitterness and the mystery pork’s crunch. My glass of Biokult sparkling rosé was a great accompaniment with its light, dry berry tones. Not to mention that I couldn’t have handled a heavier drink after that much walking. 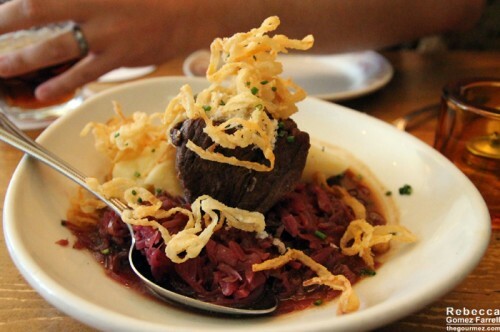 Our entree was a more conventional and well-executed Bavarian offering: a braised beef short rib with gruyère mashed potatoes, red cabbage, horseradish, crisp onions, and red wine jus. I was worried about the horseradish because it often overwhelms me, but it was subtle in this mix, providing a bit of an edge to each bite. The mashed potatoes were gummier than I enjoy, but the short rib was delightfully tender and the sauce rich enough to make it shine. For an afternoon spent burning many calories walking San Franciscan hills, this was a wonderful way to get them back. Even if you don’t make it to Leopold’s until after the wait time’s climbed, I’d say it’s worth it. The dishes could be a bit more finessed, but it was fully satisfying, hearty fare.